Brought to you by the #1 Blender brand. It's the ultimate blender for the ultimate frozen drink. The ice shaver shaves ice from the hopper into the blending jar. 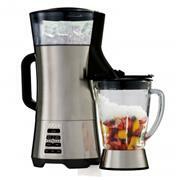 Then you blend with frozen drink ingredients for smooth, delicious, restaurant-quality beverages. Use pre-programmed ice shaver setting for perfect, professional-style results. This Oster® Blender is made in North America, and backed by the superior quality and power of All-Metal Drive.